This recap of airline photo policies has been updated to reflect the current policies as we enter the summer of 2018. If you are among the millions of people who will be taking to the skies during the summer travel season that is just getting underway, it is a good idea to review your airline's policy about photography before heading to the airport, lest you find yourself kicked off the plane and sent back to the terminal. With videos of several incidents aboard U.S. airliners going viral in the past couple of years, it may seem that any rules about in-flight photography have been tossed out. Not true; most of those videos violated airlines' photography policies, which usually include the provision that passengers should not photograph other passengers without their permission. American Airlines flight attendant dares passenger to hit him. Fair enough. Asking permission to photograph someone else seems like common courtesy and common sense. But policies sometimes have additional restrictions. Specifics to follow. A major dust-up brought the issue of the rules around in-flight photography to the forefront in 2013 when Matthew Klint, who writes for the blog Upgrd.com, was thrown off a trans-Atlantic United Airlines 767-300 after he used his iPhone to snap a picture of the display screen in the seat back in front of him. A flight attendant (F/A) rushed over and demanded he stop, which he did, but it didn't end there. You can read Matthew's story here. Since then, incidents involving travelers who were confronted for taking pictures in - or even of - airplanes brought the issue back around. 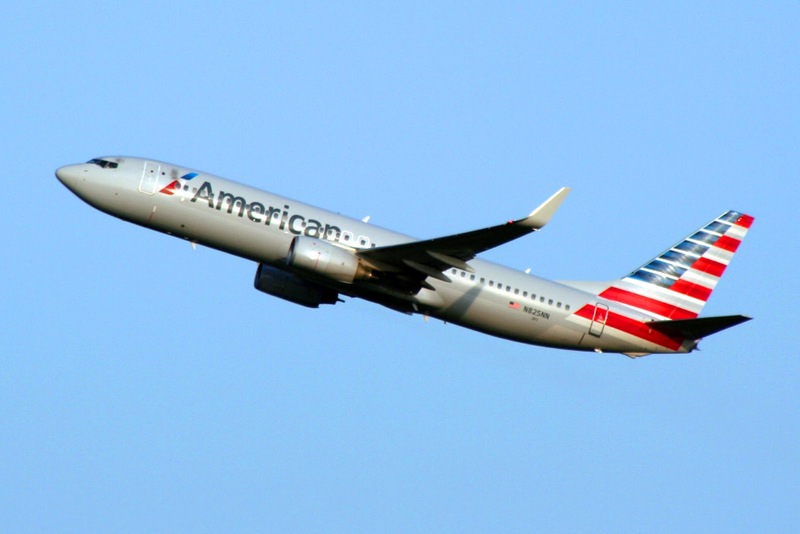 In one such case, a traveler was chastised for snapping a picture of an American Airlines (NASDAQ:AAL) plane that was sitting at the gate at Washington, D.C.'s Reagan National Airport (DCA). Arash Shirazi was waiting for his flight Los Angeles (LAX) when he decided to take a picture of the plane. A gate agent who saw him demanded that he stop and said he would be noting Shirazi's "security breach" in his travel records. In fairness to American, Washington, D.C. exists in an atmosphere that is highly politically charged and where security concerns are paramount. It is quite possible that it was airport rules and not airline policies that prohibited or discouraged photography from the terminal, from which one can literally see many of the city's monuments and the U.S. Capitol. I did not receive a response from officials at DCA when I asked them to comment. As to photography on aircraft, I am an active travel writer and have taken dozens, if not hundreds, of pictures of and aboard airliners operated by Air New Zealand, All Nippon Airways, British Airways, Emirates Airline, Iberia Airlines, now-defunct US Airways, Alaska Airlines, Virgin America, and others. I've used everything from the camera in my phone to my full-sized digital SLR. I have never tried to hide what I was doing, and no one has ever said a word to me about it. I was initially shocked when I heard of Klint and others being scolded or worse because, virtually every time I fly, I see lots of my fellow passengers snapping away. So, with the summer travel season upon us, it seemed appropriate to update this list of airline photo policies. It is important to understand: There is no FAA regulation that prohibits photography on commercial aircraft. In other words, it is not "against the law" as some F/As have reportedly told passengers when demanding them to stop taking pictures. FAA spokesperson Allen Kenitzer confirmed this, as well as the fact that each airline sets its own policy. Accordingly, there are bound to be differences from one airline to the next, so I reached out to the airlines I had contacted previously to be sure the information about their photo policies was up to date. The United Airlines' (NYSE:UAL) policy that was in place when Klint was ejected from his flight started out clearly enough but then took a twist that left it a bit confusing and allowed for a fair bit of interpretation. Since then, it has been simplified to reflect the basic principles of "Common courtesy, common sense." United's media relations department directed TheTravelPro to the Photo and Video section of its website, which reads: "The use of small cameras or mobile devices for photography and video is permitted on board, provided you keep the purpose of your photography and video to capturing personal events. Photographing or recording other customers or airline personnel without their express consent is prohibited." The policies of the other airlines contacted are equally straightforward. American Airlines (NASDAQ:AAL) has a clear, uncomplicated policy that is detailed in its in-flight magazine American Way ... if you can find the policy. In part, it reads, "The use of still and video cameras, film or digital, is permitted only for recording of personal events," adding that "Unauthorized photography of video recording of airline personnel, other customers, aircraft equipment or procedures is prohibited." However, the policy is contained within a section titled, "Flight Mode." The first paragraph discusses the need to put electronic devices into flight mode, which most of us already know and do. The second paragraph contains the policy for in-flight photography, which I view as a separate topic. Further, the policy is not readily accessible on its website, www.AA.com. Searched using the terms "photography" and "in-flight photography" returned a message that, "We didn't find a match." jetBlue has no formal photo policy but instead trusts its employees to evaluate matters on a case-by-case basis. "Our crewmembers use their professional judgment in evaluating the appropriate use of photography or videography on board, especially when it involves the privacy of other customers and the safe and secure operations of the airline," spokesperson Tamara Young confirmed in 2016, while emphasizing that passengers are expected to abide by crew member instructions. "Failure to do so, or otherwise demonstrating a potential risk of escalation or confrontation with customers or crew members in flight, may result in a customer being removed from the aircraft," the communique concluded. 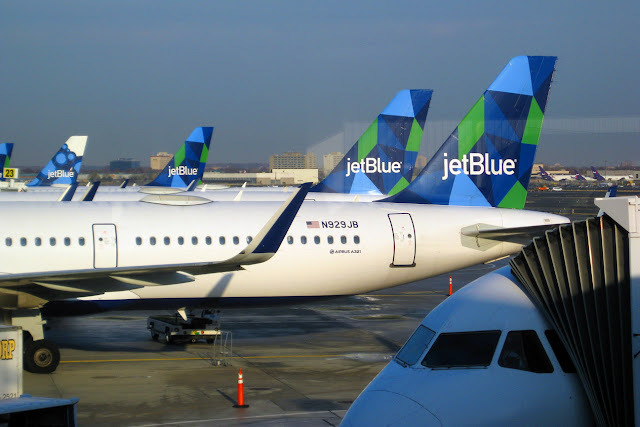 However, according to the Washington Post article in 2016, both American Airlines and jetBlue have internal policies that allow employees to stop passengers from taking photographs or filming at their discretion. In late 2015, American Airlines updated its internal policies to allow employees at the airport, including ticket counters, gates, cargo, baggage, and on board, to stop passengers from taking pictures, as in the incident noted previously. Same for jetBlue. "We understand you may want to document your travel on Southwest Airlines. 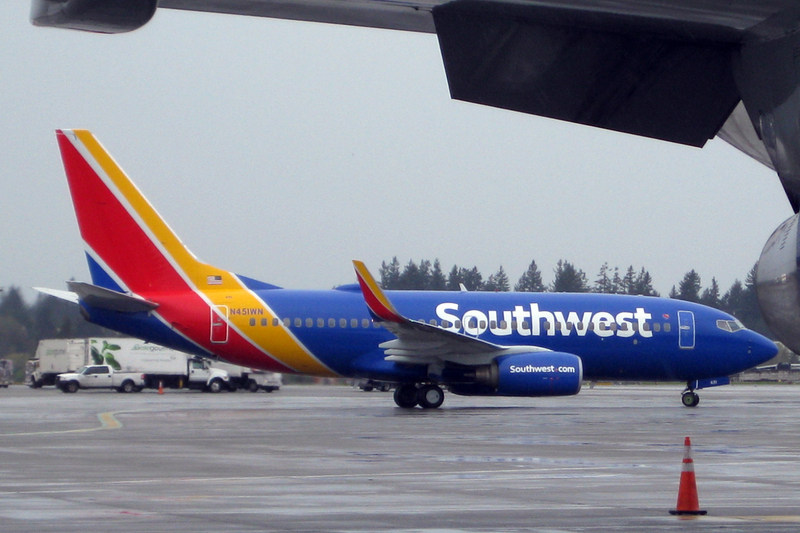 Want to photograph and/or record Southwest Airlines Customers or Employees? Let them know first! The use of cameras and mobile devices is permitted onboard to capture personal events but can never interfere with the safety of a flight and should always respect others’ privacy." The photo policy at Delta Airlines (NYSE:DAL) as expressed in 2018 is also unambiguous. "You may use small cameras/mobile devices to take pictures on your flight. Always get consent from other passengers and crew members before including them. If a crew member asks you not to use your camera/mobile device, follow his or her instructions." Again: common courtesy, common sense. That didn't stop conservative political commentator Ann Coulter from snapping and publishing pictures of flight attendants and the "dachshund-legged woman" who was occupying what Coulter believed should have been her aisle seat in the summer of 2017. I opined at the time that perhaps Delta could have used that as a reason to bar her from future flights. 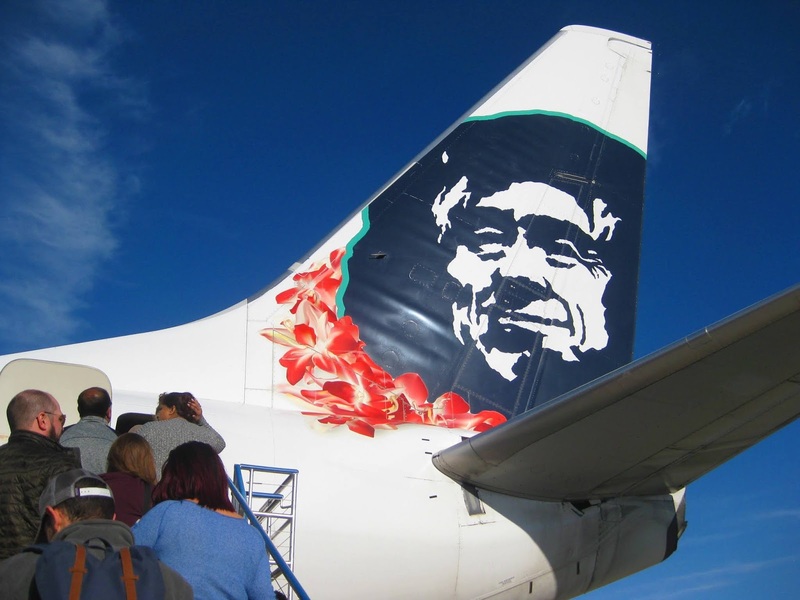 Alaska Airlines (NYSE:ALK) "[P]ermits passengers to take photos or videos on its planes [and] are welcome to share photos of their positive experiences on Alaska on Facebook or Twitter," spokesperson Ann Johnson confirmed in 2018. However, Alaska does have other policies that passengers should keep in mind when deciding whether particular photography or video filming is appropriate. "For example, passengers should not take photos when crewmembers ask them to stow equipment in preparation for takeoff or landing. Passengers should also be respectful of other passengers on the plane and the Alaska crewmembers." Again, common courtesy, common sense. Virgin America on ramp at LAX. Virgin America's policy is essentially unchanged from 2013. The carrier "actively encourage(s) our guests to use their cameras and post their experience on Virgin America," an airline spokesperson confirmed. British Airways trusts in the good judgement of its passengers. "We know customers delight in taking travel pictures and they are welcome to do so," spokesperson Caroline Titmuss said in 2016. "We do ask that any filming is done with the least amount of disruption to the other customers for their own safety and comfort. We would also ask that customers do not take photographs or record other customers or our employees without their prior permission." German carrier Lufthansa has no specific policy in place. "We just ask our passengers to comply with the rights of our [other] passengers," such as asking permission before taking a photo of someone you don't know, airline spokesperson Nils Haupt responded for my original article. Australian airline Qantas trusts its passengers to use their good judgement. "As long as passengers comply with electronic devices policy for TTL [taxi, take-off, and landing], there are no rules per se," airline spokesperson Sarah Algar told me at the time of my original article in 2013. She added that passengers should ask permission before taking pictures of flight crew or other passengers. While laptops must be turned off and stowed for taxi, take-off and landing, small electronics have generally allowed to remain on from gate to gate since late 2013, though some airlines direct that the devices be unplugged from the in-seat power supply for take-off and landing. Likewise, U.A.E.-based Emirates and Japan's All Nippon Airways (ANA) also trust their passengers' to use common courtesy and common sense. Taking pictures for personal use is OK as long as it doesn't interfere with the safety of the flight. That means you won't be allowed to do anything that could be construed as interfering with the flight crew. No pictures of other passengers without asking. No pictures of the flight crew without permission and, in some cases, not at all. If you're a commercial photographer who will be selling your work, you will need to obtain permission from the airline in advance. In short, common courtesy and common sense should serve you well if you plan to take pictures in flight. However, if in doubt, ask. And if you are asked to stop, do it immediately and without argument. It is not worth taking the chance that, like Klint, you could find yourself back in the terminal, waiting for the next plane to your destination. 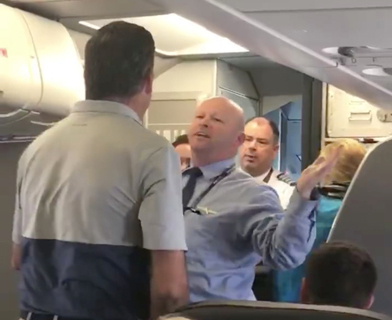 Two of the most infamous videos to go viral -- the dragging of Dr. David Dao off a United flight and the American flight attendant challenging a passenger to hit him -- were clear violations of the proviso to "Ask permission first." However, attorneys have commented in published articles that there was "a public good to be served" by recording these incidents and that it is not against the law to do so; it is against the airline policy. In other words, a traveler might be in trouble with the airline but, unless they become unruly or a threat in some other way, they shouldn't be in trouble with the law. Australian airline Qantas trusts its passengers to use their sensible judgement.